In the 16th century, a number of historical personages came to visit. In 1530, Martin Luther, who preached in the castle chapel, and the Elector of Saxony were guests, followed in 1547 by Emperor Charles V and the Duke of Alba. The dukes of Saxe-Gotha acquired the estate in 1679, but seven years later, much of the castle was destroyed by fire and only partially rebuilt. In 1826, the castle became a district court under the dukes of Saxe-Meiningen and was rebuilt in the manner we see today. My favorite castle hotels are those that are owned by someone with a passion for the architecture and history and who, stone by stone, brings new life to it. If you’re on a budget and want to experience an authentic castle hotel, this is the place. Gräfenthal is just over the border from Bavaria. Coming from the west, take route 281 in the direction of Neuhaus am Rennweg. Continue on and take L1098 east. 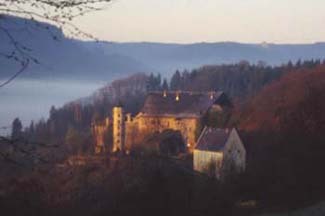 Start looking for signposts with“Schloss Wespenstein” and Gräfenthal. Castle is on the hill. Schloss Wespenstein is a delightful work in progress. Every year, a new building goal improves the integrity of the castle structure. A stay here is authentic and romantic. No fancy frills needed! And the best part is the friendliness and warm welcome from the staff. Picturesque and tranquil, the Schiefergebirge Mountains in the distance enclose a world from some other century. Guest rooms are clean and functional. If you wish an en suite bathroom with a shower and toilet, opt for the apartment. Otherwise, the bathroom is across the hall on a share basis. The castle has a restaurant that is open every day for guests. Food is tasty and at reasonable prices. Outside is a beer garden. There is also a communal kitchen where you can prepare your own meals or perhaps a lunch to take on your excursions. It is possible to stay here just one night, but it is preferred that you stay a while, and room rates will be discounted accordingly. Events, such as carnivals, dances, music, and banquets, are held every month.